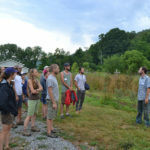 Balsam Gardens has a great perspective on “Scaling Up,” the theme for our eighth CRAFT tour of the 2016 season. 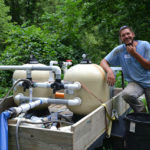 The initial inception of Balsam Gardens seemed to be that of many small-scale farms in the WNC region; growing from an 1/8 of an acre, selling at farmers markets, providing a CSA, and marketing to restaurants. The difficulties of making a living were still consistent. Their story line took a turn, as they started questioning exactly what it was they wanted from being farmers. “Part of farming is asking yourself what you want out of it. We didn’t want to be on the business side of things, we just want to grow food. Selling wholesale allows us to do just that,” advises Becca, half of Balsam Gardens’ owner-operator team. Eventually, the retail side of their business stalled out, and the wholesale side grew. Burnt out by trying to be their own advertisers, distributors, AND producers, Balsam Gardens began to sell to New Sprout Organics, a wholesale marketing agent and distributor based in the Southeast. “A lot of people farm because they love the connection to the people that they sell too. 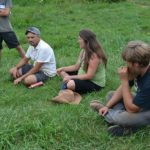 Really, I just love to grow massive amounts of food,” explains Steven, Becca’s partner and the farm production manager. 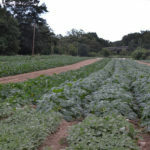 Currently, New Sprout has three farms that they purchase from in North Carolina, and Balsam is one of their larger, more consistent growers in this area. You can find New Sprout produce in Ingles and Whole Foods Markets across the Southeastern region. Steven and Becca no longer sell any produce outside of what they sell to New Sprout, which has actually allowed them to grow considerably over the last eight years. As long as their vegetables pass the quality control standards that are agreed upon in their contract, they are guaranteed an 85/15% split on the produce that they grow. A planting plan is organized between the farmer and New Sprout, to ensure that the proper quantities and types of vegetables are being grown each year. New Sprout maintains the packinghouse and refrigerators in their distribution center in Black Mountain, which has allowed Balsam to completely omit any infrastructure on their land. 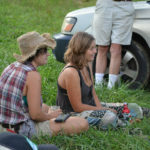 This has allowed them to lease open, conveniently placed acreage from the city for a reasonable rate. 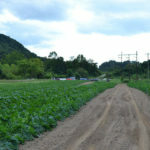 As their main expenses are land and labor, they have been able to purchase 35 acres that they are in the process of converting to Organic standards. Currently, the land is being used to pasture meat that they sell under the Balsam Gardens name. 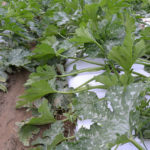 They employ 30 people over each growing season, ensuring paid hourly work for an eight person crew six days a week from May until the last frost. They pay people to harvest, but not much else. Steven himself does all of the planting, and much of the weed control. 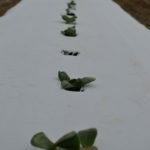 They direct seed their squash, but everything else is purchased as starts from Banner Greenhouse. They prioritize keeping the vegetables as clean as possible in the field, to then transfer directly to packaging provided by New Sprout. This is clear in their meticulously kept field, with a lot of black plastic being used not only for biological control but also to keep low-hanging fruit off the soil. Daily pickup is scheduled through New Sprout, to ensure prompt and proper cooling. Scaling up is only possible with a supportive and enduring market. 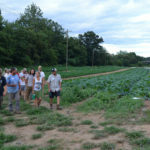 By taking the weight off of self-promotion, Balsam Gardens has become a thriving 17-acre organic production site and now supports Steven, Becca, and their two young children along with those that they employ each year. Wholesale marketing is an important angle to consider through the exploration of a farm’s growth and scale. Thank you Balsam Gardens for this perspective to consider! The babies starting their journey. Steven explaining his irrigation techniques. 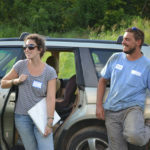 Steven and Becca describing their farming journey. A description of the fields. Interns learning about Scaling Up. Balsam Gardens’ 17 acre sight in Asheville.